This is my first attempt at building a boat. 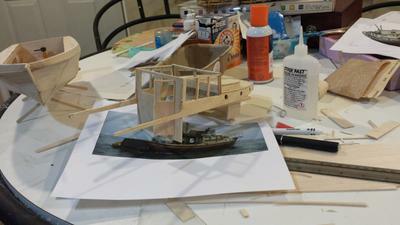 I really liked the way RC cabin cruiser plan was designed in that it was simple and easy to put together. I never knew building a boat was such a reflective and therapeutic exercise. I really got into it. 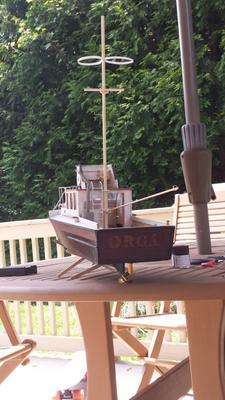 In the middle of the building process, I became more ambitious and decided to modify the cabin so the boat would look like Orca, a fishing boat from the movie, JAWS - one of my favorite movies. I printed several movie stills off the internet and measured relative dimensions to so it would fit into this hull. It took me about 2 and a half months from start to finish. One of the challenges I encountered was that there weren't many good parts sold in the hobby shops here in the states that can be used for my project. I ended up ordering a 30mm dia / 150mm shaft length brass propeller from Cornwall model boats in U.K. Also a 36mm generic nylon rudder from China via Amazon. Thank goodness for the internet. I am using Mabuchi 280 motor as recommended and re-purposed an old 2 channel radio (FM) from a never-finished sailboat kit I bought 16 years ago just before my first daughter was born (yes, what was I thinking...) Also I bought a motor speed controller for a brushed motor from Amazon. I wasn't sure if all these scrap parts will work together - but to my pleasant surprise - everything went great without a problem. I wish the motor had a bit more power, but I think it gives the speed that looks realistic on water. The biggest challenge I had was with the paint. Due to lack of my experience, I didn't know that only a certain type of paint would work with the hull that's been doped. First I've tried the Behr left-over primer I had from my house paint project before - it did work for the cabin but not for the hull that was doped. So I scraped it off. Then I tried left-over acrylic paint my daughter uses for her art class without any primer. Again, it didn't sit well and I had to wash it off. I ended up ordering Tamiya car paint from Amazon which finally gave me the finish I was after. I knew I wanted to build something that I was going to be happy with so it took a lot of patience out of me. But finally got to a point where I am satisfied with my accomplishment. I admire photos others have posted and mine is nothing near them in terms of finish and detail. But as a first project, I am very proud of what I was able to produce from your fine plan. Thank you. You can see my boat in action following the link below. Thank you for your feedback. 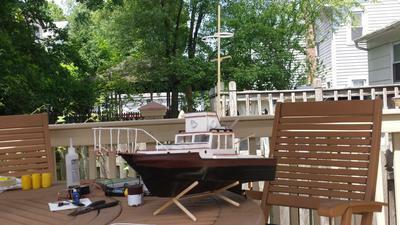 I will definitely try cellulose primer next time I build another boat. I liked Tamiya paint but it is expensive. I used Tamiya 86005 Paint Spray, Black for the bottom half of the hull. Tamiya TAMXF9 81709 Acrylic Mini XF9 Hull Red for the top half. Both are of very high quality in terms of the consistency of the color and texture. I wasn't sure if I needed a thinner but I didn't need one. It is very smooth. I will also try a different motor to increase the speed a bit. I hope to post a link to video once I make modifications. What a beautiful boat you built. I built a couple of boats using these plans but never thought about creating a boat like yours. Simply fantastic. I share your pain with the painting part. What kind of particular paint you used for the hull? I believe you mentioned Tamiya paint but, anything in specific? As a fellow 'first time builder' I can relate to a lot of the comments in your post, like me you found the internet a valuable resource for researching the finer points of the model you wanted to achieve. I found Petter's plan produced a brilliant platform but like you I played about with some parts to get what I wanted. I used a Tamiya 540 motor (from an RC buggy) wow ! does it fly !! Love the look of your model, bet it won't be long before you start another one. 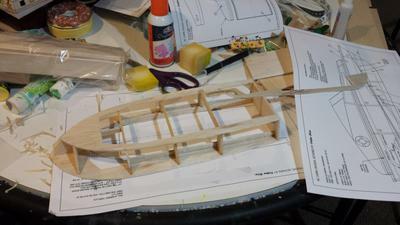 I've already started my second build, (a canal boat, known in the UK as a narrow boat.) For this one I produced all my own templates using CAD. It's a copy of an actual boat owned by some friends of ours. I'll put a post on here when it's complete. That is really neat! I never ever thought the Cabin Cruiser could be such a versatile platform. Other builders have made mods to the original design, but you certainly took it to the edge of my imagination with this project! I'm very impressed. Hats of to you, my friend! Thank you for sharing!